The modern Lalique Company has reproduced the Rene Lalique Bacchantes Vase in crystal basically continuously since production of Lalique crystal began after the end of World War II. These crystal reproductions have continued to bring this iconic Rene Lalique design into the homes of tens of thousands of people worldwide even to this day. The Bacchantes Vase has been reproduced most commonly in clear and frosted crystal, but also yellow amber and gray colored crystal as well. Unfortunately, some of these modern crystal vases have appeared with altered signatures and sometimes added patinas to be passed off as original R Lalique Bacchantes Vases. By far the most common vase seen in this altered state has been the clear and frosted version. 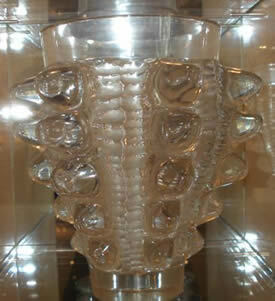 And this has created problems for unsuspecting collectors of the works of the great Rene Lalique. But little known is the fact that the Bacchantes was also reproduced after the death of Rene Lalique in opalescent crystal, appearing with the signature LALIQUE CRISTAL FRANCE! Pictured here is just such a vase and two photos of the signature. One of these crystal opalescent versions appeared at the U.S. Antiques Roadshow in August 2003 in Oklahoma City that aired in March of 2004, and we thought bringing this to your attention would be a good opportunity to talk about the existence of these crystal reproductions and give a little information and advice about what to look out for. 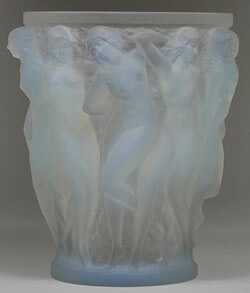 A modern opalescent Bacchantes Vase has also appeared with a typical script Lalique France signature, and bearing all the other signs of post war production as discussed below. The hallmark of the post war crystal reproduction Bacchantes is that the bottom of the vase is flat and does not have the concave or indented center section to the underside of the base which is typical of original Rene Lalique Bacchantes. This is the key point to look out for. 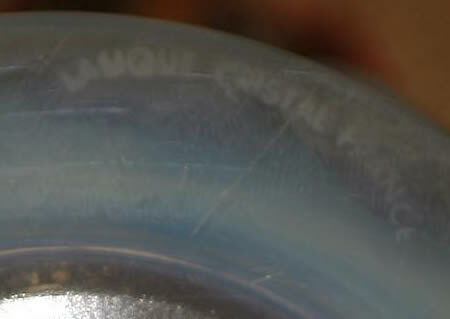 Does this mean that any concave bottom Bacchantes is guaranteed to be an original Rene Lalique vase? No, and for two reasons. First, we cannot say that there was never a concave bottom crystal version made post war OR that a flat bottom Bacchantes was never made by Rene Lalique. Anything is possible. But even the Oracle has never seen a flat bottom Bacchantes vase that was definitely an authentic original Rene Lalique Glass Bacchantes. So in any event, for R Lalique collectors, we recommend avoiding any flat bottom Bacchantes Vase even if you believe it to be an authentic original. 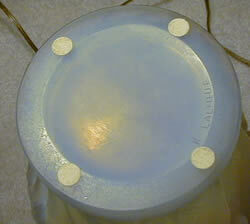 It’s just not worth being wrong, and getting one with the concave bottom eliminates many risks and concerns. So when they tell you “It was made that way”, just reply, “I’d like one made the other way“! 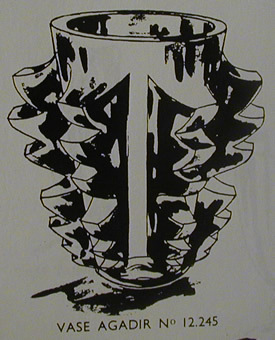 But the second point: It is possible to alter a flat bottom vase and polish out a concave center section to the underside of the base. It’s a lot of work and will involve some expense and some risk, but the stakes are high, with the original R Lalique vases being worth much more than the post war crystal reproductions. At the time this article was originally written it said: “We have not seen such a vase, but technically it is possible and just something to keep in mind.” However, we have seen several such vases in the years since this article originally appeared. We have seen modern colored Bacchantes that were altered by experienced glass workers from the Alsace region of France, including making the bottoms concave and adding forged pre-war signatures. The perpetrators were apparently caught but not until after some number of forged Bacchantes had made their way to the market. Those expertly altered and forged vases are almost certainly still out there in various collections and will appear in the future. There actually is a third point, that there might be close copies out there! But none are known so this is not an issue. 1. Crystal is heavier than glass, and it feels different. Your best defense is to have handled thousands of pieces of R Lalique so you might know just by handling if you have an original glass version, or a later crystal reproduction. 3. Deal with an honest and competent seller!!! Dealing with an honest and competent seller is not the end of all potential problems, but if you have a choice, an honest and competent seller is the way to go. Not starting out every purchase having to think about how the seller is trying to get one over on you* does provide some assurance and makes the collecting experience a lot more enjoyable. Of course when buying online or making one-off purchases thru similar methods, you may not know much about the seller and we highly recommend in any event getting as educated as you can and spending your time focusing on the item you plan to purchase. But if you know your seller or dealer makes a living selling R Lalique, then you definitely want to be dealing with someone that is both honest and competent. And when you combine dealing with an honest and competent seller with getting independent expert advice from a reputable consultant, you have drastically reduced the chance to have regrets and you are much more likely to obtain high quality examples at fair prices and build a great collection in a much more pleasant way. So on the day when the flat bottom opalescent Bacchantes comes your way, you will know to say: I’d like one made the other way! And yes, we know poetry is not our strong suit** here at RLalique.com! And if you want to know more about Lalique Crystal, the crystal items made after the death of Rene Lalique, a good starting point is the Lalique Crystal section of the Rene Lalique Biography at RLalique.com. There you’ll find links to all the information on RLalique.com about Lalique Crystal, and also a link to the website of the modern crystal maker Lalique S.A.
*to get one over on you – to try and slip something by you, to dupe, trick, fool, or deceive you. On the other side of the pond there are similar expressions with similar meanings in use in different parts of the country – “get over on you”, “to have you off”, or “to have you on” are three examples. Lalique North America announced the opening this Fall of a joint Lalique – Haviland Store in New York, which will replace the previously closed Lalique Boutique in the big city. This announcement, follows through with the previously released strategy to join Lalique and Haviland operations in North America, and mirrors the Lalique – Havilland London flagship store opening earlier this year. As discussed previously on these pages, Lalique and Haviland have joined operations in the US for the purpose of gaining operational efficiencies and cost savings, as new Lalique Cristal owners Art & Fragrance, and FSG implement their strategic plan to strengthen the brands of both subsidiary companies, which will remain separate entities notwithstanding the operational joining. It’s obvious that Art & Fragrance and FSG are working hard in an innovative fashion during these difficult times, to solidify and enhance their joint operations. We wish them well. Lalique and Haviland announced that they will join their U.S. operations, naming Lalique North America CEO Max Zouhairi as CEO of Haviland’s U.S. operations as well. The new arrangement will effectively bring nearly all operations in the U.S. of Lalique and Haviland together, while maintaining separate corporate identities. Joint stores, marketing, warehouses, shipping systems and general operations seem to signal a merger in virtually every way except the corporate paperwork. 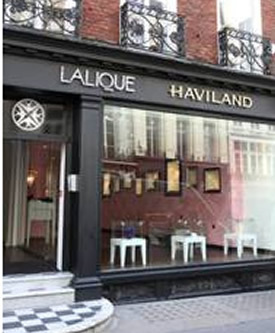 These developments were foreshadowed by the joint Lalique – Haviland store opening in London and related events reported on these pages in April of this year. 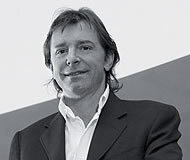 These are difficult times for many luxury goods suppliers and retailers, and Art & Fragrance, the recent purchaser and majority owner of Cristal Lalique, has not gone untouched by the worldwide economic difficulties, having just reported in May a loss for 2008 of 11 million CHF or about 10.3 million US Dollars. This Lalique – Haviland operational merger in the U.S. is designed to cut joint operating costs and at the same time maximize the marketing advantage of two of the greatest names in decorative arts and consumer products. Along these same lines, just to let you know they aren’t letting the grass grow under their feet on this, they are having a joint Lalique Haviland Warehouse Sale in New Jersey on June 11th, 12th, 13th and 15th! Lalique and Haviland Join Forces and Open A Joint Flagship Store in London: A renewal of old ties between the family name of Rene Lalique and the family name of David Haviland was cemented in London recently, with the opening of the new Lalique Haviland joint flagship store on Conduit Street. This store name recalls ties between these two great families that go back to 1916. Here is a brief history: Haviland was started in 1842 by David Haviland. He was a member of a New York family that imported and sold china. In the early 1840’s he traveled to Limoges France where he founded the great Haviland manufacture. His two sons, Charles and Theodore were active in the business, Theodore in New York dealing with marketing matters, and Charles, the oldest of the two sons in France at the factory in Limoges. After David Haviland died in 1879, Theodore moved to Limoges to participate more directly in the management of company affairs. For whatever reasons, by 1891 the two brothers had irreconcilable differences and joint control of the Haviland Company was dissolved, with each brother going it his own way. Charles operated under the old family company name of Haviland et Cie, and Theodore under the name Theodore Haviland Limoges. The two brothers competed not just with other companies, but against each other. The last decade of the 19th century also saw the rise of the great Rene Lalique, who’s reputation as a jeweler and designer in Paris had spread worldwide. Lalique’s primary focus in the last decade of the 1800’s was jewelry and unique objects. It was the famous glassmaker Emile Galle who recognized Rene Lalique as the “the inventor of modern jewelry”. In 1892, Lalique had a daughter by his second wife, whom they named Suzanne. Suzanne became an accomplished designer and painter in her own right, without any formal art training. Growing up as close to the great Lalique as one can get, was all the training required. Her vase designs cover two pages in the R Lalique Catalogue Raisonne, and her paintings and decorative arts are now spread around the world. At least two Rene Lalique production vases were designed by Suzanne Lalique; the vases Sophora and Penthievre. She also created great porcelain designs for Haviland during the last half of the 1920’s and into the early 1930’s, and she is credited with having painted in 1931 the only recorded portrait of Rene Lalique created late in his life. And of esoteric interest to both historians and stemware collectors, is the SH monogram which graces the stemware set Monogramme in the Catalogue Raisonne. These are the stems that start at #5042 on Page 831 of the 2004 edition. These stems were sold in minimum orders of 100 pieces. But for the big order, Lalique et Cie would put your own monogram on each stem. That’s probably how they figured out the name for this design! Apparently, Suzanne Haviland was an early customer :). As things would have it, in 1916 Suzanne met the photographer Paul Haviland, the son of Charles Haviland, when Paul was slightly older than shown here in an 1884 portrait at age 4 by noted painter Pierre-Auguste Renoir. Paul was an accomplished photographer, and among his other claims to fame, he would be given photo credit for the pictures in the 1932 R.Lalique Catalogue, a fact omitted from the 1981 Dover reprint! Paul was born in Paris, but graduated from Harvard and spent much of his early life in the United States. 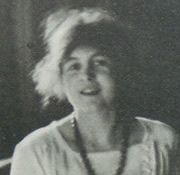 Having been called back to France to help with the management of the company in 1916, that same year he met and by 1917 would marry Suzanne Lalique. Long story short, Charles died in 1921. Theodore died two years earlier in 1919. The Haviland et Cie family businesses of Charles had lots of problems and became a full employment company for lawyers! Haviland et Cie eventually slipped out of family ownership and was liquidated in 1931, but the Theodore branch of the family continued on with their company under the leadership of Theodore’s oldest son William, who had joined the company in 1903 and who took control upon the death of his father. The Haviland name and company was restored to unity and total family ownership in 1941 under William Haviland, when he and other relatives purchased all the names, designs, and rights of the previously liquidated Haviland et Cie. One interesting point is that from 1942 to 1957, Haviland was produced in Pennsylvania, production having been started up there by William in the chaos that was World War II. Fast forwarding a bit, control of Haviland would find it’s way to the current owners Financiere Saint-Germain (FSG). Here is a link to an informative Haviland website. Why do we care about all this? Well, that’s the start of another (much shorter) story. A final note: Paul Haviland died in 1950, and Suzanne Lalique Haviland, having lived to the age of 97, died in 1989. For more information on Rene Lalique and his family, see our Rene Lalique Biography. Lalique Rarity: The Lalique Vase Agadir – Unusual Post War Lalique Vase That Is Factory Signed R.Lalique! 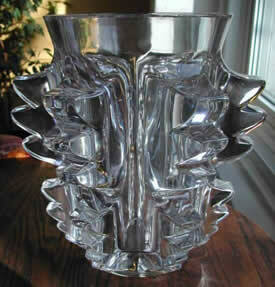 Lalique Rare Vase Appears With A Good R.Lalique Signature: The Lalique Vase Agadir! Ring any bells? It’s Lalique Vase model number 12.245. It appears in the catalogue right after the Lalique Vase Everest, which of course is number 12.244, and right before the Lalique Vase Vincennes, number 12.246. But the catalogue is not the Catalogue Raisonne. It’s a 1950’s Lalique Cristal-Paris catalogue. 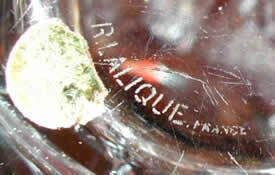 But here it is, in the flesh (a LOT of flesh we might add), with what by all appearances is a good R.Lalique signature. And this sure seems like the sister vase to the Cristal Lalique Vase Paimpol (shown in the last photo below), which is model number 12.240, and which appears in the book Lalique Glass, by Nicholas Dawes on Page 105! As you have likely surmised, this excellent book, among it’s other virtues, is the favorite Lalique book of Mr. Dawes! Mr. Dawes states in the book that the Paimpol vase had a wheelcut R.Lalique signature. And we have word coming out of a meeting of Oracles held to discuss this very subject, that one of the Oracles that participated in the meeting confirmed beyond doubt the authenticity of the R.Lalique signature on the Paimpol Vase! Do you have any R Lalique vases that weigh in at one pound per centimeter? This vase doesn’t really seem to fit nicely into the Archers, Perruches, Serpent, Alicante style, that’s for sure, but other late vases also don’t fit very well either. Of course this one seems particularly ill fitting! What else? It’s heavy like crystal and seems a lot more Mark than Rene in overall style and design. Hmmmm. All things considered, when the fog of history, the fog of war, and possibly the fog of adult beverages prevent total illumination, it’s best to go back to basic precepts, one of which is: With R Lalique, the signature cannot authenticate the piece! This is true even when the signature is “authentic”! So unless documentation appears in the future showing otherwise, what we have is a post war Cristal Lalique Vase made after the death of Rene Lalique, with an R.Lalique signature applied at the factory. And for those of you who were wondering this whole time what the name Agadir means, it’s the name of a good sized Atlantic port city in Morocco. The city was made famous in 1911 by the Agadir Crises, in which France, Germany, and England all played a part, and which lead to France establishing a protectorate over Morocco. Now, the most important question: Who among you has a glass shelf that can hold this monster vase?